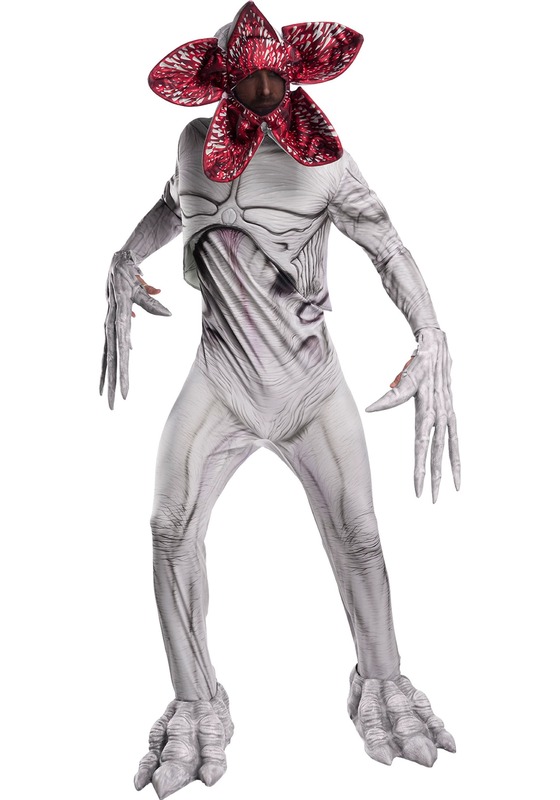 If Demogorgon happens to be your favorite character on the show and seeing him leave would cause you great sadness, wear this adult Demogorgon costume to support him. Your devotion is crucial and now is definitely the time to show it because the Demogorgon could slip back into the Upside Down for good! The officially licensed Stranger Things costume comes with a printed jumpsuit that fastens together via Velcro tabs. A protruding rib cage covering the top portion of the body creates a cool 3D effect while the glove accessories recreate the monster's long spear-like fingers. Shoe covers feature elastic straps match the costume and can fit over all-sized feet. Finally, the headpiece is stretchy and easily slips over the head. It also features a mesh lookout hole and the intimidating petals, of course. The petals stay puffed out for a supremely scary look all the time. To Demogorgon! Show your support for all of the monster's terrifying lifecycles by getting friends to dress at the Demogorgon's less-evolved forms.